Microsoft has released a new version of Skype for desktop, and this one looks and feels just like the mobile version of Skype. The only catch is that Microsoft is forcing everyone to upgrade to Skype 8.0 as all previous versions are set to stop working within weeks. 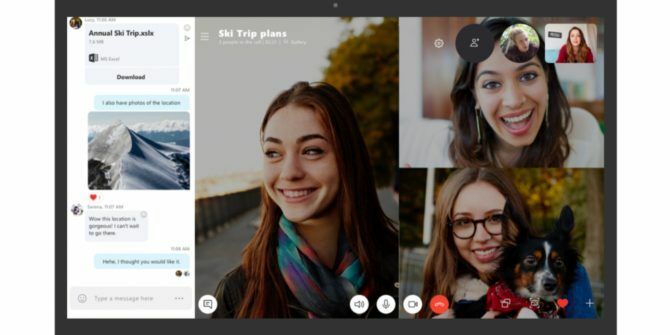 The new Skype arrived last year Microsoft Redesigns Skype for the Next Generation Microsoft Redesigns Skype for the Next Generation Microsoft has launched a new version of Skype which has been redesigned from the ground up. Skype's makeover borrows elements from Snapchat, Instagram, and Facebook Messenger. Read More to mixed reviews. The new Skype, which was designed to appeal to the next generation of Skype users, landed first on Android and iOS. However, it’s now also available on other platforms, including Windows, macOS, and Linux. The new version of Skype for desktop, Skype 8.0, is designed to replace Skype 7.0 (also known as Skype Classic). Microsoft is recommending everyone upgrades at their earliest convenience, as, after September 1, 2018, only Skype 8.0 will function. Microsoft claims this is to “ensure that all customers have the best possible Skype experience, and that there are no quality or reliability issues resulting from old technology and new technology interoperating.” Which is fair reasoning. Skype 8.0 offers free HD video and screensharing calls, @mentions for more productive messaging, a chat media gallery to help you find files in conversations, and the option to share photos, videos, and other files up to 300MB just by dragging and dropping. On the Skype Blog, Microsoft also shared what’s coming next, including read receipts as standard in other messaging apps, private conversations, cloud-based call recording, and profile invites and group links to help you start conversations more quickly. Microsoft is doing the right thing in trying to make sure Skype users enjoy the same experience across multiple platforms. However, forcing people to upgrade to the latest version of the desktop within the next few weeks is bound to annoy some people. Skype 8.0 is a vast improvement over previous versions of Skype for desktop. And judging by the new features Microsoft has lined up for the future this is just the beginning. But if you really don’t like the new Skype, there are plenty of free Skype alternatives 6 Free Skype Alternatives for the Windows Desktop 6 Free Skype Alternatives for the Windows Desktop Have you had enough of Skype? This group and video chat messenger has tough competition. Here are six free services that can replace Skype for you. Read More . Explore more about: Microsoft, Skype.